Add these visually engaging widgets to your website and blog. They are automatically updated when you add or change a listing on RealBird. The Featured Listings Map inventory widget shows all your RealBird listings. Embed it on your website and blog easily. It's an automatically updated module: every time you publish a new property on RealBird, the map updates with your current inventory. You can configure this widget to show your active (for sale or for rent) properties only, your pending, sold inventory or any combination thereof. 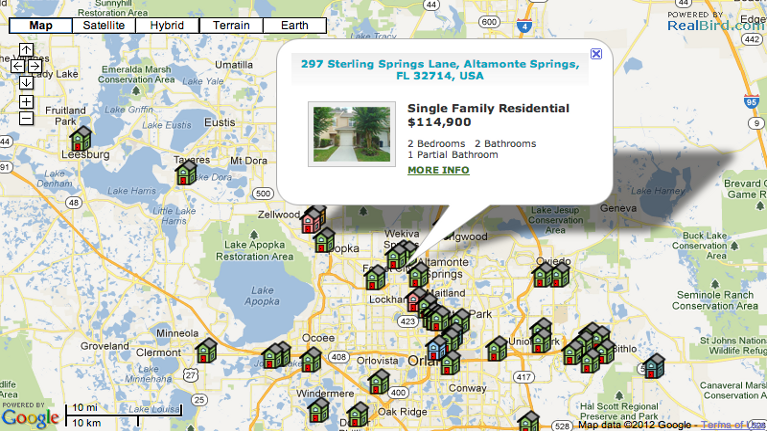 Using as a sold inventory widget is a great way to show closed sales as a presentation tool to win new listings. The inventory slideshow module is a compact, but visually engaging widget that loops through all of your listings with eye-catching animation. The easy-to-use configuration tool in the member area allows background color customization to match your website and blog design perfectly and advanced options let you choose between different animation effects. The Photowall inventory widgets put the focus on your property pictures and are suitable for those listings that have excellent photography. Upon click-through on a photo, the corresponding single property website is shown to your visitors. You can configure the size of the slideshow to match the placeholder size on your website and blog. Also available is the RealBird Facebook Page app which uses this Photowall widget as one of the Facebook marketing options.